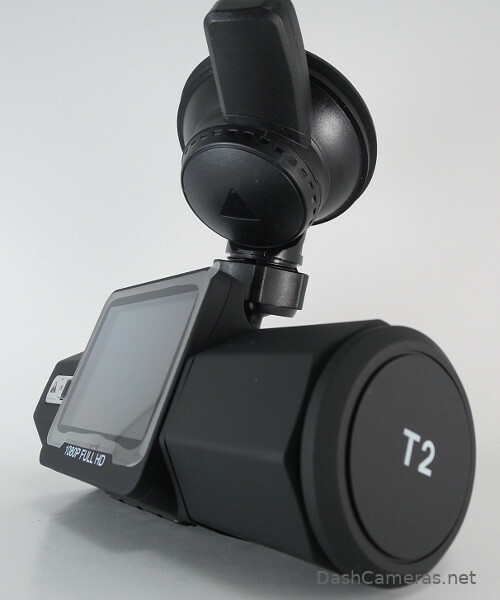 The Vantrue T2 is a tube shaped dash cam, selling in the mid price point range, while offering full HD video. The T2 advertises itself as a 24/7 Surveillance Super Capacitor camera, which means it can hold up in extreme weather conditions. The super capacitor battery works in temperatures as cold as -4°F to as hot as 158°F (-20°-70°C). The Vantrue has an OBD power mode that uses less power than other power sources so it eases the strain of your car’s battery. It has 1080p HD video quality and the Sony Exmor IMX323 sensor and NOVATEK NT96655 processor. 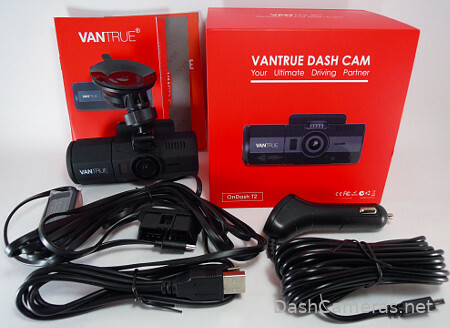 The camera claims to have no image distortion and can capture balanced footage at night, which Vantrue calls ‘Super Night Vision’. There’s a front and interior view so you can view the inside of the car as well as the front. The cameras are in one unit though so you can’t record the rear unless you get a separate camera. The angle is 160° and has a F/1.8 aperture lens to capture the most out of your surroundings. With H.264 video coding, the Vantrue T2 captures great quality images and optimizes storage space for the maximum amount of video footage. The Auto LCD screen on the camera turns off when it starts recording. While this might be good for some drivers who see the additional screen as a distraction, others might want to see what they’re recording. The Vantrue has a feature called the Wave Guard Parking Mode because it uses the Wave Guard Indicator, which uses microwaves to detect motion in front of the car. Once motion is detected, the camera will automatically start recording. There is also a Time Lapse function where the camera can form a video out of pictures it takes at specific intervals. There’s also the usual G-sensor and loop recording, as well as an option to take pictures while recording with a button on the camera. Built-in GPS is included to track the driving route, location and speed on your computer, but this is an optional feature that requires an additional purchase of an extra GPS mount. The Vantrue T2 supports microSD cards up to 256GB, provides an 18-month warranty, and works with 12V and 24V vehicles. 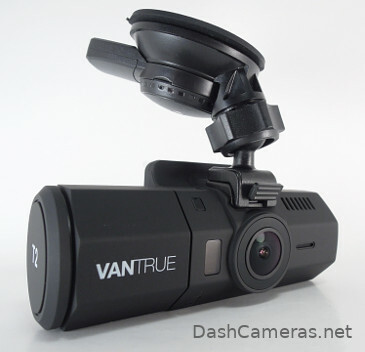 Vantrue has consistently posted firmware updates for their cameras, so you will be provided up to date firmware upgrades if they come along for this camera. Now for the pros and cons. This camera sells for $170 on Amazon, so it’s solidly in the middle as far as prices go. It’s about four inches wide, so it’s a bit larger than some cameras, but it’s still pretty inconspicuous depending on where you mount it. It does have excellent video quality. Almost every decent dash camera these days has at least 1080p video quality at 30fps, but the camera’s processor still makes a huge difference when recording. Even if a camera records in HD, it could still have choppy video and poor night vision. The new Sony Exmor processor really helps improve visibility at night and keeps the video quality smooth and consistent. The wide video angle also means nothing is cropped out. You can see all the lanes of traffic as well as all the lanes in wide intersections. It also automatically adds the speed of the vehicle onto the footage and shows you the route you took if you installed the additional GPS mount. There are also many great things to be said about the mount. Unlike some cheaper cameras where the mount falls off and doesn’t move to change the camera angle, the mount for the Vantrue T2 is a bit more sturdy. There are many positive reports about the mount and how it stays on, even in extreme weather. It’s an adjustable suction mount camera and is super flexible, so no matter how you install the camera you should be able to turn it in order to get the best angle for footage. 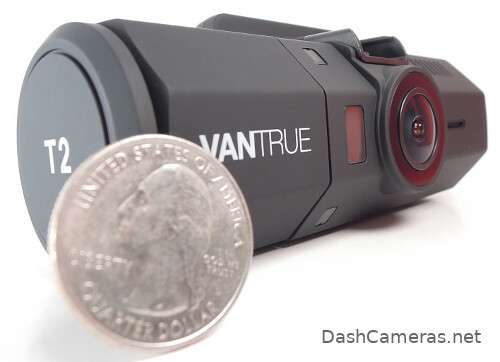 The Vantrue T2 is largely seen as an upgrade from the earlier Vantrue cameras. This new camera has a larger screen, which could be a bad thing depending on your preference, but many see it as an improvement. The optional GPS mount has been improved and is now more sturdy because it uses a ball joint. This mount makes it much easier to place the camera behind the rearview mirror the makes it inconspicuous. 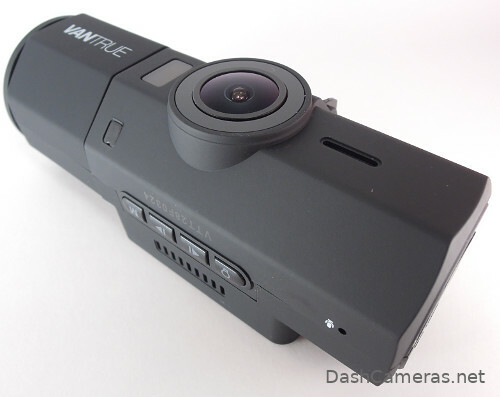 This camera doesn’t have a built-in WiFi connection or a companion app, which is common among other dash cameras, even those at this price point. This means that in order to take files off the camera you need to use the SD card and you can’t share videos like you can with a WiFi connection. A WiFi connection might be more important to some than it is to others but it is important to keep in mind. There’s also no cloud function, but that feature usually doesn’t appear in cheaper or middle ranged cameras anyway. So what’s the verdict? The Vantrue T2 is a solid camera for the price. 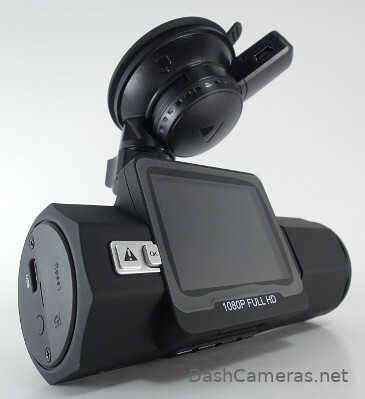 It doesn’t have as many features as some other high quality cameras out there, but it does have the basic features you would need from any dash camera. The new sensor really helps with the camera quality and it’s clear that the company is making improvements with every model they make, especially with the quality of the mounts. While the GPS feature is an additional cost, it’s done very well and worth the money, but if you don’t need GPS then it’s still a great camera. If you’re alright with a few features being absent from the camera, like WiFi and a companion app, then this camera is probably at the perfect price. The manufacturer is responsive enough to make constant improvements on hardware and software, giving additional firmware updates regularly. 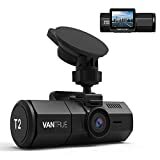 With an 18-month warranty, the Vantrue T2 has great value for the money and is a great buy for the average dash camera user.